Laramie, Wyo., summer 1985. The bus shuddered along at a crawl and then stopped, brakes exhaling sharply — whshhhh . The driver pulled a lever, folding the door in with a thud, and stumped down the steps to the ground. A passenger, a black person, also got up and walked off the bus. And kept walking, away into that high-plains Western cowtown. Now there was just one black person left on the bus, a college student on his first trip West. When the young man had got on the bus a whole day earlier in Tuskegee, Ala., to head across the country for a summer job with the Forest Service, the bus had been filled with black people. As the bus moved West, stop by stop all of those folks got off, and the white folks got on. The young man just sat there in wonder, watching that other guy disappear. “Why are you getting off in the middle of nowhere?” he silently asked him. A day and a half later, of course, he was doing the same thing. The bus pulled into La Grande — propped in the high desert of northeast Oregon — and young Tyrone Kelley, son of tenant farmers from a small, rural black community, got off and walked for the first time into a small, rural white world — a setting that would become the nearly constant backdrop of the next 20 years or so of his life. Not that he knew that, yet. It was summer. He had one more year to go at Tuskegee University for his bachelor’s degree in mechanical engineering. And he had come West just to see something new and earn some money counting trees for the Wallowa-Whitman National Forest’s silviculturist. Orleans,*May 31, 2007. * The air inside the multipurpose room at Orleans Elementary School was stuffy and somebody had opened doors and windows to let the breeze in; outside, the early evening sun still held enough heat to soak the walls and earth, and a sunbaked spiciness mingled with the wet smell rising from the nearby Klamath River. A bright green canopy suffused with yellow light hung over the schoolgrounds, and the reclining hour was drawing out the birds. All around, the mountains — a densely packed diversity of alder, fir, madrone, maple and more — crowded close. Other than the birds and occasional passing cars, it was quiet — this far down Highway 96, on a weeknight, not much went on. About 40 people had gathered inside, where sunlight slanting through windows and natural light from skylights illuminated walls covered in children’s paintings — mostly studies of birds, trees, mountains, rivers; things a kid would know best, growing up in this steep, green, isolated world. Several members of the Karuk Tribe were there. The rest of the faces were mostly some version of Caucasian transplant — aging back-to-the-landers, young farmers, loggers, foresters, retired and current Forest Service personnel, teachers, artists, environmentalists. They were going to now try to craft the plan together, under the authority of the Healthy Forests Restoration Act. He said he and Orleans District Ranger Bill Rice would work collaboratively with the community — tribes, environmentalists, loggers, teachers, everyone — to come up with a plan they could all live with. People fidgeted. A woman in a red dress asked, how could it be a collaboration if right off the bat the Forest Service was controlling the agenda? “This meeting was set up specifically to show how the collaboration process works,” Kelley replied, patiently. The idea of getting to personally shape the project was nice. But under this HFRA process, the final plan was final — you couldn’t appeal the decision everyone had made together. And it was going to take a lot of daytime hours of actual field work — time many people with jobs couldn’t spare. So its shape would be defined by whoever was able to participate. The meeting continued. It grew productive, optimistic. 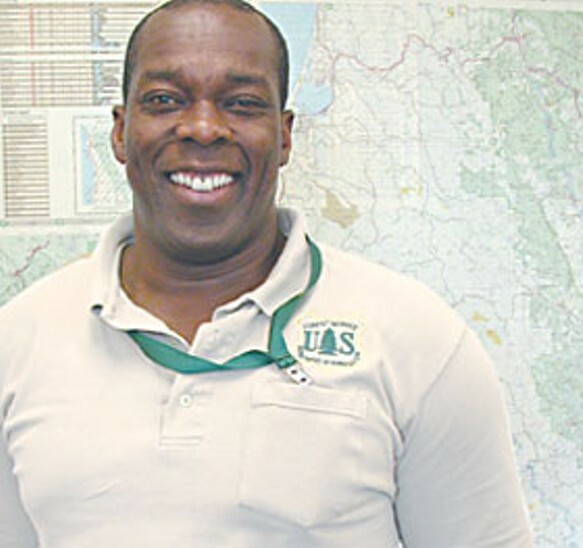 But the question must’ve been on a number of people’s minds in that room: Collaboration or not, the ultimate decision-maker for the Six Rivers National Forest was Tyrone Kelley — would this new supervisor, just a year into the job, be able to restore the trust some people said had been broken for years? What sort of man was he? Who did he represent? Was he, as the NEC’s King suggests, “hired to get out the cut”? It was partly youthful randomness, but mostly being in the woods, that hooked Tyrone Kelley into the Service. Not that he’ll effuse about it. Though friendly and open — and thorough when answering questions — Kelley doesn’t offer up too much extraneous commentary. He rides his bicycle. Watches movies. Goes on walks. Wonders why there are so many homeless people here. Marvels at a place where people wear sweaters in the summer. And misses his friends and family back in Alabama. Likewise, his office inside the Six Rivers National Forest headquarters in Eureka is spacious, uncluttered. On a small table sits an old Osborne Fire Finder, a handsome piece, round with a sepia topo map on its flat top and two thin arms with sighting apertures for eyeing a fire in the distance then plotting it on the map. It was surplus from a lookout; a ranger gave it to Kelley. There are a couple of chairs, a desk, some maps of the Six Rivers on the wall. Another table has an American flag folded into a triangular box on it. It was left behind by somebody who’d had the office before him. And that’s pretty much it — as spare and clean as a backcountry campsite left in good order by the previous occupant. Kelley has been here since last June, taking over from Jeff Walter, who left for Oregon to be the Ochoco National Forest’s supervisor. 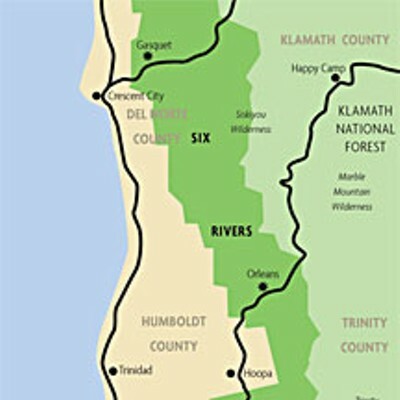 Kelley inherited a million-plus acres sandwiched between private and national park lands on the coast and the Trinities, and stretching 140 miles from the Oregon border to Mendocino County. Six Rivers National Forest is packed with trees of nearly every kind — pines, firs, cedars, tan oaks, madrones and more. Biologists call it a relic forest, a seedbank of the past. It has old-growth reserves, where the northern spotted owl lives, and plantations of same-age trees grown in after a timber harvest. It’s a forest famous for lightning strikes, and native tribes have long used fire to clear living space and promote basket-weaving grasses, so most of the species evolved under a regular fire regime. And, like other national forests where fire was mostly suppressed over the past hundred years, some areas of the Six are thick with overgrown brush, fire-intolerant plants and crowded, weedy tree stands. Clearcuts replaced by plantations haven’t helped matters. Kelley got here just in time for a nasty fire season, by the end of which 27,959 acres of the Six had burned. But he knew all about these Western forests. He’d even served on some hand crews fighting fires, including one in Happy Camp. He’d been with the Forest Service for the past 20 years, mostly out West, mostly in California. The issues were familiar to him. And once he was in, he even dreamed that he might like to be Deputy Chief someday. Which makes Kelley, as a supervisor with ambition to rise higher, a rarity. And there’s a reason blacks aren’t flocking to the agency. “The Forest Service, it’s a hometown kind of agency,” Kelley says. “What you find is, the supervisors offices, they’re going to be in small towns like this; ranger districts are going to be in rural areas; and they’re in the West. And most of the African Americans live east. That means you’re going to be somewhat isolated. Some of the things that normally would be there for me — something, say, as simple as a haircut, it’s just not there. Food, churches. There’s no place to get grits. Those were big changes for me. And so you have to adjust to the culture that you’re living in. It goes back to that guy getting off the bus in Laramie — I was like, why is he doing that? After his summer job in La Grande was over, back in 1985, Kelley told the Forest Service folks he probably wouldn’t be back. But after he graduated, friends advised him not to hang around Tuskegee. He was divorced, his three kids were with their mother. He should do something. “So I called La Grande, they said yeah, and I said I’d be there in two weeks.” This time, he had a full-time position with the forest in the civil engineering department, building roads. Here is where the attentive reader will sit up. An engineer, building roads in the forest. After La Grande, he went to San Dimas to work in the Forest Service’s Technology Development Center, where he tested fire-retardant chemicals and, in a different project, came to the Pacific Northwest for the first time to test a prototype truck tire whose pressure could be adjusted on the go, allowing for varying road conditions. He missed home, so eventually took a job back in Alabama at the Southern Research Station, developing instruments to collect data on forest harvest techniques. In 1995 he moved to national headquarters in D.C., where he worked on engineering budgets, drinking water issues, abandoned mine cleanup legislation, among other things. By 1999, he was back in California, as a staff officer on the Eldorado National Forest, on the west slope of the Sierra. Missing home again, in 2003 he transferred to the National Forests in Alabama. Then, in 2005, he moved back to California to be deputy forest supervisor in Tahoe. The supervisor left for another job, and suddenly Kelley was the acting supervisor. When a permanent supervisor was hired, he applied for the supervisor job at Six Rivers. So, was he hired to “get out the cut”? He laughs again, says, “Me being from a small farm, rather than us always asking, ‘Say, just give us money’ — that wood’s valuable. We’re still looking to enhance the forest. You know, forest health. We’re looking to do those projects that are habitat enhancement — for the owl, and for the marbled murrelet (which we don’t have much of). Not to mention the fuel reduction work, for fire. And some of those can yield some commercial product. And that commercial product can offset the cost of doing that work. And so those are very reasonable things for us to look at. Because, one of the things we struggle with is the budget. It is going down. Most of it is going into fire protection. Professionally — talking forests — Greacen is skeptical. 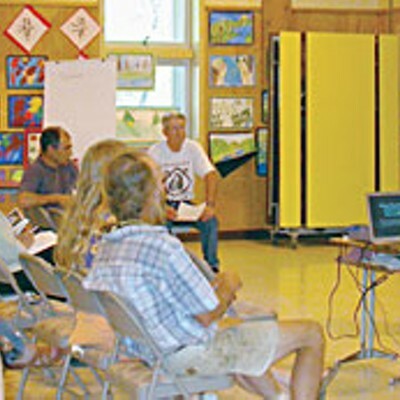 Greacen serves on a public advisory committee created under the Northwest Forest Plan, which provides guidelines for forest management on 20 million acres. 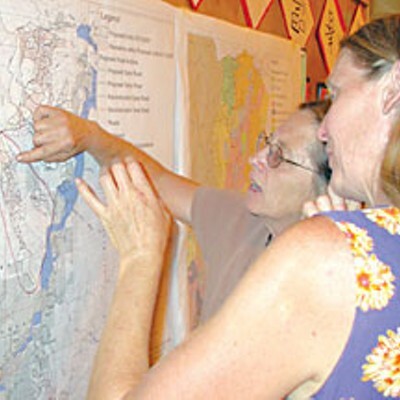 The Bush administration, he says, has been systematically trying to unravel the NW Forest Plan. One example is a shift in interpreting the term “PSQ” — “probable sale quantity” of timber on a forest. Under the Clinton administration, PSQ was a target number, a ceiling not to be exceeded. But, says Greacen, now the PSQ is a floor — that is, a sales quota to be met. It may sound like just talk. But Kelley seems sincere. And even Greacen says he actually feels “guardedly optimistic” that the supervisor and his staff are listening now on the Orleans Community Fuels Reduction Project. And Sandi Tripp, director of natural resources for the Karuk Tribe, and who was at the May 31 meeting in Orleans, says the tribe’s relationship with the Forest has actually improved since Ranger Bill Rice, and later Kelley, came on board. Orleans*, May 31* . 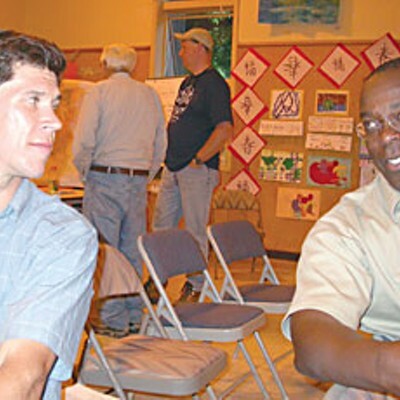 The meeting was nearly over, and community member Ben Riggan was chatting with Forest Supervisor Kelley. “You could have done a better job” earlier on in shaping the project, Riggan told Kelley, nicely.